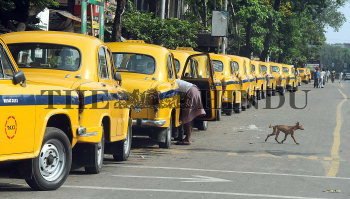 Caption : Kolkata: The roads of Kolkata was out of all mode transports on Tuesday. The 12-hour nation-wide bandh called by 13 non-NDA and non-UPA parties to protest against price rise hit normal life and affected air and rail services in Left-ruled states of West Bengal. The shutters in commercial areas were down. Hundreds of passengers were stranded at railway stations and airports for want of transport. Photo: Arunangsu Roy Chowdhury April 27, 2010.